If your Amp is not fitted with 'Headphone'-or-'Line-Out' Sockets - This Box will solve your Problems. All Valve Amplifiers must have a 'Load' at the Output, usually this is a Speaker. If a Valve Amplifier is used without a Load, it will rapidly destroy the Output Valve/s, Output Transformer or Both. 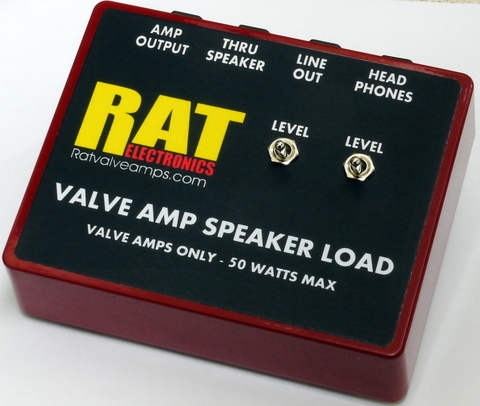 The RAT 'VALVE AMP SPEAKER LOAD' Box is designed to REPLACE the Speaker and allows you to use your Amp with standard Stereo 'Headphones'. It also offers a 'Line-Out' for connection to a Slave Amp, Mixer or Recording Equipment (DAW). There are independent 'Level' (Hi-Lo) switches to set the 'Headphone' and 'Line-Out' Volume. If you wish to use your Amp as normal (with the Main Speaker active) you can still use the 'Headphone' -and- 'Line-Out' Sockets. Also, a lot of 'Balanced/Emulated' Direct Injection (DI) Boxes use a 'Feed-Through' System where you connect your Valve Amp Speaker Output to the 'DI' Box, then connect the 'DI' Box back to your Speaker. The RAT Dummy Load will REPLACE the Speaker allowing the 'DI' Box to be used Silently (NO Speaker Connected). If you are not interested in a 'Balanced/Emulated' Output, then the RAT Dummy Load can be used as the main 'DI' Box. The RAT Dummy Load Box can also be used as a 'PSEUDO FX LOOP' - allowing Time Based Effects (Delay, Echo, and Reverb) to be Sent to a 2nd Amplifier. The 'LINE-OUT' is 'RAW' - NO Speaker Emulation. This gives the True Sound of your Amp. Most DAW (Digital Audio Workstation) Software has Multiple Speaker Emulation settings. The 'HEADPHONE' output is Stereo (2x Mono) and Frequency Corrected (Reduced Bass). Works with All Stereo Headphones. Your Amp Must have a 4, 8-or-16 Ohm Speaker Output Socket. 1. - Disconnect the Speaker from your Amp - Connect a 'SPEAKER LEAD' from your Amp Speaker Socket -to- the 'AMP' Socket on the RAT Dummy Load Box. 2. - You can now use your Amp as normal, with NO Speaker connected, using 'Headphones' -or- 'Line Out' -or- Both. 3. - If you want your main Speaker Active - Connect your Speaker to the 'THRU SPEAKER' Socket on the RAT Dummy Load Box. The Amp and Speaker will work as normal and you can still use the 'Headphone' and 'Line Out' Sockets. The Dummy Load Box will get warm with use as it is converting the Speaker energy into heat. Any Valve Amp will work fine. The Dummy Load can be used with Amps producing more than 50 Watts (see the 1st Video Below) at REDUCED Volume Levels. A Standard 1/4 inch Jack-to-Jack 'SPEAKER LEAD' is required for the 'Amp-to-Dummy Load' Connection. The Load Box MUST be matched to the Amps Output Impedance. £99 - including Delivery in the UK. £117 - (UK Pounds) to anywhere else in the World. The Colour of the Box may Vary. Please 'CONTACT' me and I will send you a PayPal Invoice. RAT Dummy Load Box used with a Bugera 120 Watt Amp. Clip of RAT Dummy Load used as a 'Line Out'. Clip of a RAT Dummy Load used as a 'DI' Box (No Speaker).